KNOXVILLE, Tenn. — While most of the country is focused on basketball this time of year, March means a different kind of competition for a talented group of University of Tennessee soil science undergrads. 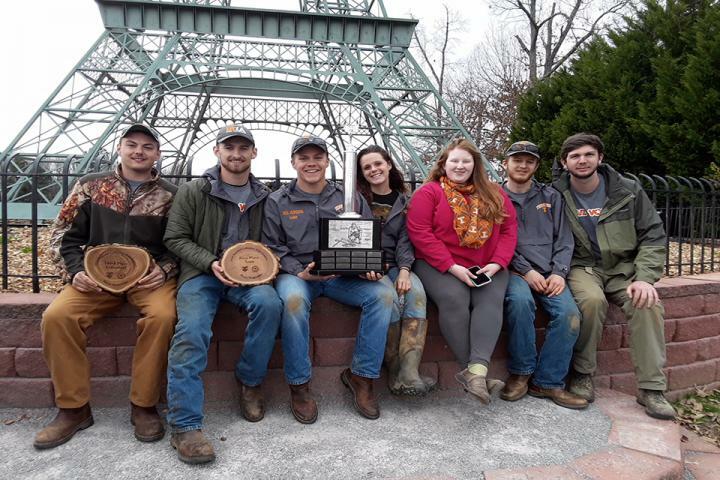 Representing the Biosystems Engineering and Soil Science department, seven students traveled to Martin, Tenn., to compete in the National Collegiate Soils Contest, ultimately winning first place in the competition and a national title. Dating back to 1961, the National Collegiate Soils Contest is an annual event in which students identify, evaluate, classify, and describe three soil profiles. UT's team competed against 22 of the nation's top collegiate soil judging teams, and this historical win places the program among an elite company of national winners. According to team member Will Luke, a senior in environmental and soil science, "Winning a national championship for the university and department is a fantastic reward for all of us. We are incredibly happy to bring something back to a place that has given us so much over the last four years." In addition to the national win, team member David Gentry, a senior in environmental and soil science, placed third in the individual competition and has been invited to join Team USA as a result. Team USA will compete in the International Soil Judging Contest in Rio de Janiero, Brazil, later this year, and UT's own Andrew Sherfy, a lecturer in Biosystems Engineering and Soil Science, has been selected as head coach. Both of these honors represent firsts for the University of Tennessee. "To be selected as head coach for Team USA is an honor that will never escape me. I am grateful that I will get to extend my responsibilities as an instructor to lead a diverse team of students on an educational experience that is quite literally once in a lifetime," says Sherfy. Winning team members include Thomas "Beau" Badon, a senior from Dickson, Tennessee; Emily Belanger, a senior from East Kingston, New Hampshire; David Gentry, a junior from Clinton, Tennessee; Will Luke, a senior from Ducktown, Tennessee; Eli Oliver, a sophomore from Smithville, Tennessee; Kendall "Skye" Roberts, a senior from Orlando, Florida; and Daniel Sain a junior from Clinton, Tennessee. Each student is majoring in environmental and soil science with the exception of Belanger, who is an animal science major. Team advisors include Andrew Sherfy, Sean Schaeffer, and Mark Radosevich, all from the Biosystems Engineering and Soil Science department.